The river is still rising at Cape. The crest was pushed back a day. They’re predicting it will hit 42 feet on Friday and stay there for about a day before going down fairly quickly. That got me digging for one of Dad’s scrapbooks where he had posted photos from the Flood of 1943, when the river crested at 42.4 feet in May of that year. 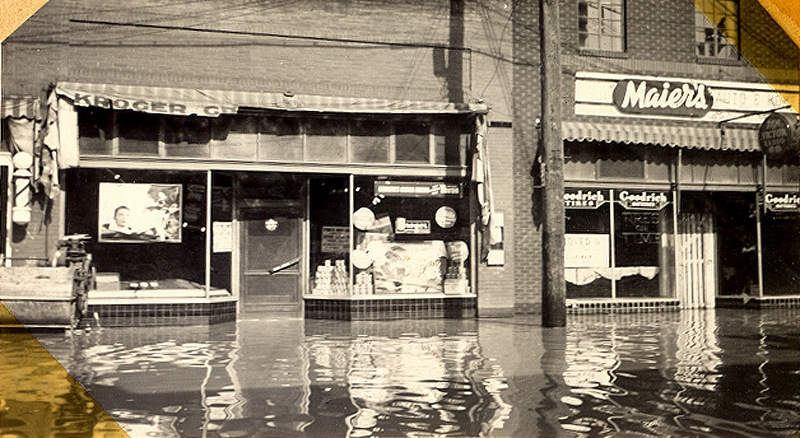 Was 1943 flood higher than 1844 flood? Some facts about high stages of the Mississippi River at Cape Girardeau, including determination that the May 1943 mark was higher than the 1844 flood have been established. 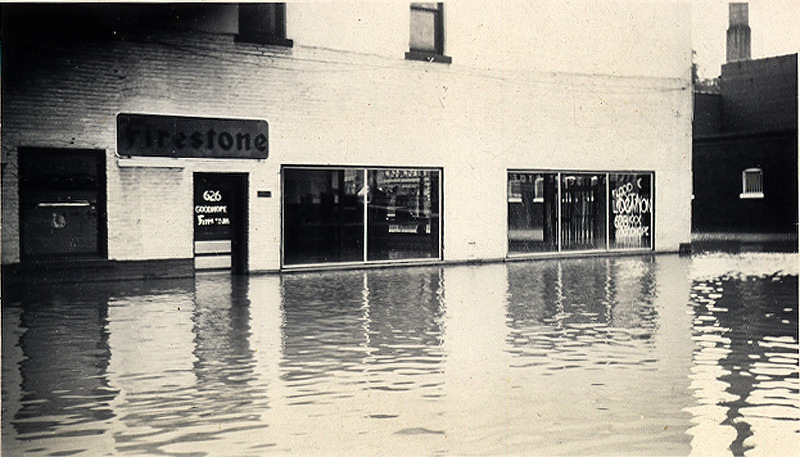 There was some contention shortly after the 1943 record flood that the water did not set a new mark. City Engineer John R. Walther and T.E. 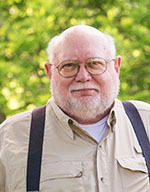 Bliss, division engineer for the Frisco Railroad, went into the matter on a mathematical basis recently and came to the conclusion that the 1943 flood was 9/100ths foot higher than the flood crest of July 4, 1984. The engineers determined tht the 1844 mark was actually 42.31 feet for Cape Girardeau and that the high mark for May 1943 was 42.4 feet, which was the U.S. Engineers’ record. 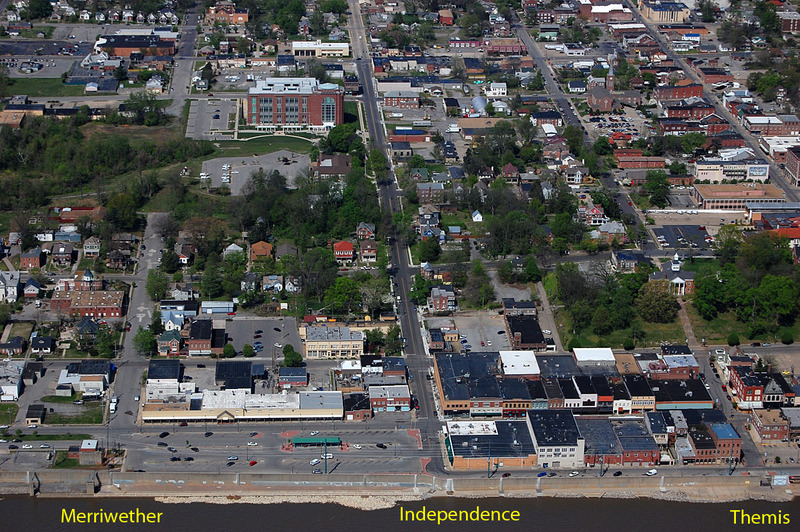 Mr. Walther and Mr. Bliss checked the actual height of both a mark and a nail in the former Houck building at Independence and Main streets, which have long indicated the previous high crest, and found them to both show the 1844 mark to have been 42.31 feet. 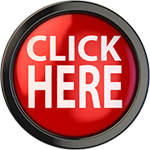 This was arrived at from the city datum, which was established officially long ago for the purpose of fixing levels. It is officially described as being 50 feet below the high water mark of 1844, government records state. They city river gauge later was established through city ordinance. The gauge’s zero is 7.75 feet above the city datum. The mark for 1844 was commonly known for some years as 42.5 feet, but the engineers say this was an approximation and was not correct. Until a few years ago, the U.S. Department of Agriculture had published the 1844 Cape Girardeau mark as 42.5. In more recent years, the government mark referred to in reports was the 1927 stage of 40.04 feet. The engineers, when making the check on river marks, notched the 1943 peak for the water on an east wall of the Frisco passenger depot. The plan is to place a marker there, showing how high the record flood – set on May 27, 1943, actually was. Well, not EXACTLY today: this photo was taken April 5, 2010. 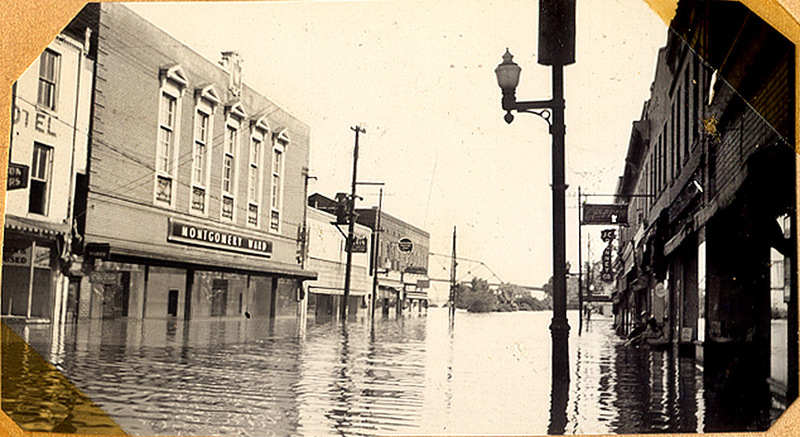 Even though the river is about at the same stage as it was in 1943, the floodwall is doing a good job of keeping Main Street dry. This is the general area that flooded. 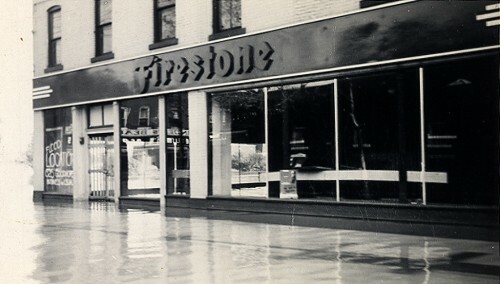 Firestone was at the southwest corner of Main Street and Independence. Everybody wants to be famous for something. They want to feel special. Even if it means about something negative. “My cancer was more life threatening than yours.” “Our flood was worse than theirs.” And the winner is: Who cares? I suppose I’m insensitive. It seems as though a lot of people care when you watch them go through the wall gate at Broadway and point to the marks of flood dates painted there. Sorry I don’t remember the floods of 1844 or 1943! I do remember the flood of 1951 which flooded the same area. I wouldn’t know how it compares but I do realize that six inches to a foot of flood water can be an important level if you are trying to keep water out of a certain area or building. I decided I was too old to help sandbag this year but have been delivering food from our food bank to workers and victims in Clarksville and Winfield Missouri. Despite what some folks think, I too, have no memory of the Flood of 1844. Like you, I think the 1951 flood is the one I can remember. I would have been about four or five then. That’s old enough to form impressions. 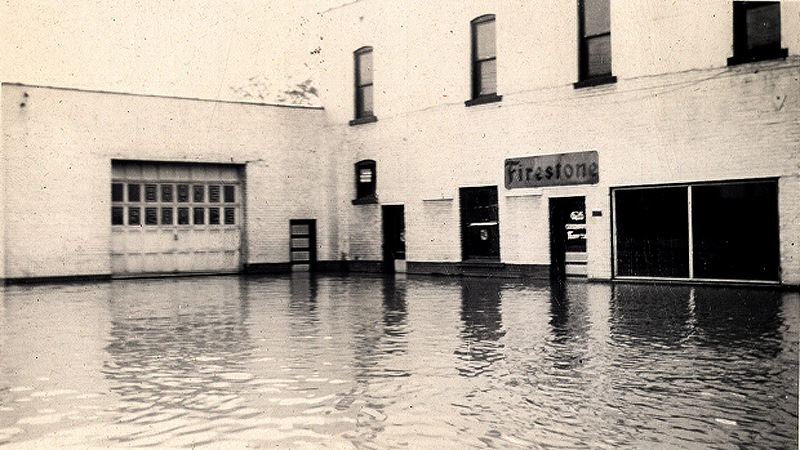 I certainly remember the flood of 1951. I went to Cape with my father and remember going to the second floor of the Montgomery Ward store on a plank from behind or somewhere in the area the Woolworth Store. That trek certainly etched itself in my memory. I clearly remember the flood of 1943 when just a boy. Grandfather Stein worked at the Cement Plant to which the workers rode on a flat car pulled by a small locamotive which was high enough to get through the flood waters. We boarded somewhere around Smelterville, I think. A vivid memory is being taken by him to the plant in the cab of the locamotive and being allowed to pull the whistle cord. 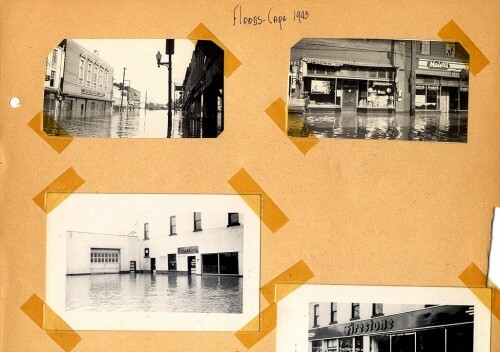 Also remember walking around the Main Street business disctict at the edge of the waters, seeing the flooded stores, and people rowing around in row boats. There was great flooding in the farm lands south of town. Worst I ever remember seeing. 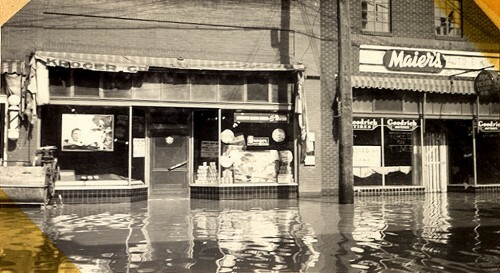 I, too, remember the flood of 1943 quite clearly. and in though the doors of the plant where he paddled around to the boiler. He took me on one of these trips and I was one thrilled kid!